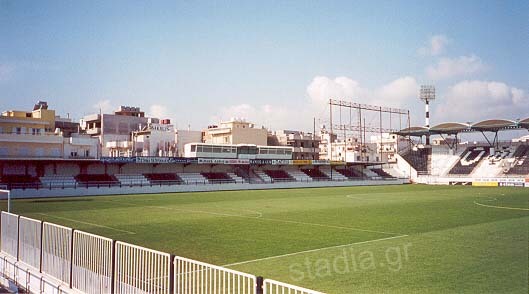 The stadium is located in Heraklion (also: Iraklio) on the island of Crete. Heraklion has an international airport, but you may also get there by boat from Piraeus. 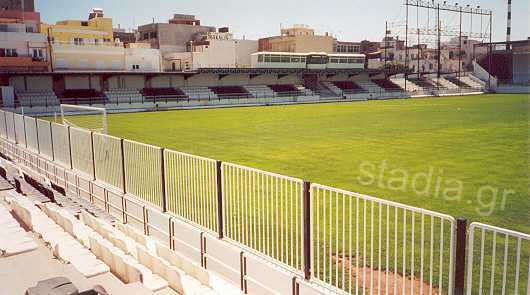 The stadium is located in Kaminia, a district west of the city centre. To get there (supposing you start outside the archaelogical museum) follow the signs to Hania and exit the venetian walls through Hanioporta. Do not continue on to 62 Martyrs' Av towards Hania, but instead turn right into Machis Kritis St, passing by the KTEL (intercity buses) terminal. One km after the Hanioporta, just before you get to the seafront, turn left into Kantanou St (there is a BP gas station at the corner). You'll reach the stadium after 100m. 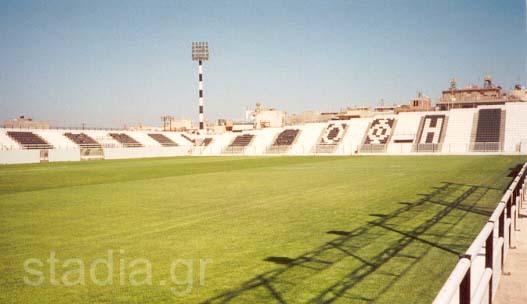 More data: OFI Stadium is now named "Theodore Vardinoyannis", to honor the man who linked his life with the club. The unusual shape of the ground's stands has very much to do with its equally unusual history. This piece of land used to be the old christian, jewish and armenian cemeteries and was occupied by the club after the 2nd World War. OFI's people went there one night and put a fence around the abandoned graveyard. The place was then leveled with a bulldozer and turned into a football field. 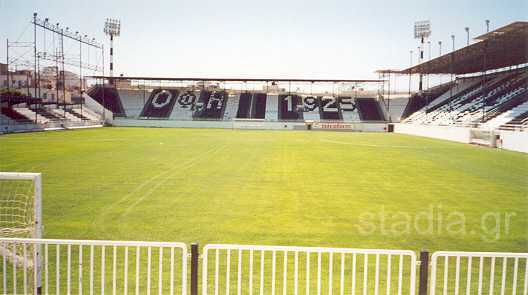 However, part of the Armenian cemetery exists to this day behind the north stand. It is the reason why this particular stand has an irregular shape (its right side looks like it is cut in two). 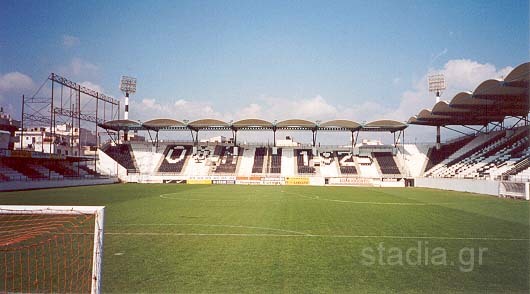 Although its stands remain the same since 1987 (when the... left half of the northern one was built), the look of the stadium is different than some years ago. In the summer of 2000 it was all covered with plastic seats, reducing its capacity from 10,500 to 9,000. The latest works of 2001 included the complete reconstruction of all the facilities below the west and north stands and the replacement of their roofs. For pictures with the old roofs see: 1 2 3. The stadium was one of the official training venues for the football tournament of the 2004 Olympic Games. 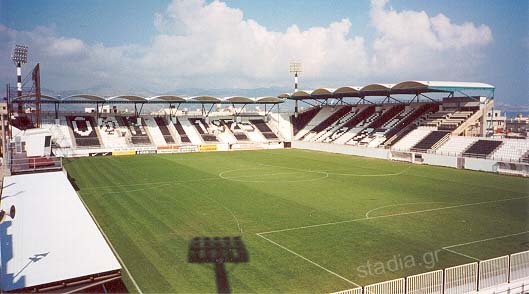 After the Olympics, in 2005, OFI FC opted to leave their ground for the then new Pancretan Stadium. The club's demotion to the 2nd Division in 2009 marked their return to their historic home. 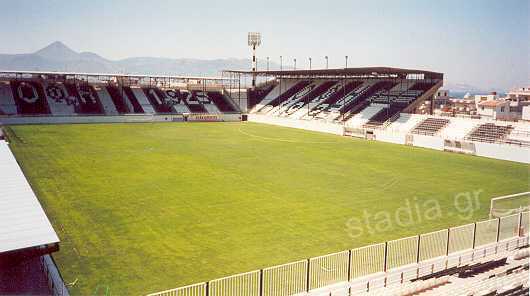 The stadium is owned by the amateur OFI club.